We have heard so much about the decline of established media brands that it is a rare occasion when one of them celebrates a milestone audience increase. Yet that is just what the BBC can do today, with the news that a quarter of a billion people around the world are tuning into the BBC's global news service every week. The Global Audience Estimate, released on Tuesday, shows that in the year 2012-13 the BBC's global news services - that is, the World Service, World News and the website bbc.com/news - reached 256m people each week, a rise of 7% or 16.6m. These are huge figures - around the world, one in every 28 people is a viewer, listener or reader of BBC global news. Eighty years after the BBC's Empire Services began broadcasting, its successor, the World Service, reaches 192 million people around the world, from Libya to Burma to Peru. This is almost double the number of people who listened at the height of the Cold War, when the World Service was often the only source of objective news. Today's media landscape - and indeed today's world - would of course be unimaginable to these previous listeners. Although many people in the UK associate the World Service with radio, we now broadcast on television in eight languages, and online in all 27 World Service languages. Added to this are our commercially funded services, BBC World News and bbc.com/news. So while radio remains the mainstay for our audiences, we are reaching out in new ways. Around the world, people are reading the news on smartphone apps, and watching news video on tablets. In Burma, where the BBC is playing a ground-breaking role, audiences are receiving news bulletins via audio bulletins on their mobile phones, and soon by text messages. Indeed, our digital services now reach an audience of 38 million every week, an increase of 8 million from last year. Mobile accounts for a large volume of this traffic. Innovations like new apps and TV services have helped us stay relevant to our audience. But they would be meaningless without what I believe is the key to our success - the quality of our journalism. Whatever media platform audiences use to access BBC news, what they will find is accurate, impartial, trustworthy journalism. In the past year BBC journalists have covered big and surprising stories ranging from the Pope's resignation, the Olympics, the US election - and the discovery of Richard III's skeleton in a Leicester car park. A significant development this year saw BBC World News relaunched from our new state-of-the-art HD studios, with a refreshed line up of programmes and presenters, including Jon Sopel, Linda Yueh and Yalda Hakim. Two of the other big factors in our audience increases have been the growth of our BBC Arabic and BBC Persian services. BBC Arabic has increased its audience by 7m viewers, 6.5m of these in Egypt. The audience grew massively during the Arab Spring and has stayed high ever since. For the first time the estimate measured audiences in Libya and Darfur. 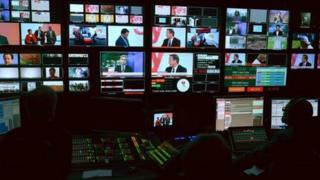 The BBC reaches nearly a quarter of the population in Darfur and 42% in Libya. The audience for the BBC's Persian service is up by 90%. Despite continued censorship and satellite blocking, more than 40% of Iranians with a satellite dish watch the BBC. This service comes at considerable personal cost to our Persian service journalists, who, along with their families, face harassment, intimidation and even death threats from the Iranian authorities. The last few years have been tough for the World Service, with repeated funding cuts, job losses and the closure of some of our language services. Today's good news comes despite, not because of this - our figures would be higher still were our journalism able to reach all the countries we did before. But as our new director general Tony Hall has said, the BBC's best days lie ahead of us. International broadcasting is a highly competitive business, which requires predictable, stable funding. The BBC Trust has announced the budget for the World Service will be better protected next year, when it moves to licence fee funding. Monday saw another important step in this transition when the Trust published a consultation on the World Service's operating licence - and a document which, for the first time ever, sets out the World Service's purpose and identity. So I am hopeful for the future of global news. The move to our new headquarters earlier this year marked a new era for all of our global news services. And the BBC's multi-lingual journalists are contributing their global insights on stories in Brazil, Russia, Iran, Syria, Turkey and Bangladesh to domestic BBC services as well. Eighty years after the BBC began its broadcasts to the world, the BBC is also now bringing the world back to Britain.